VBox video fails to build properly and 3D does not work. Unity test says it can't do 3D. I understand that Ubuntu has decided to use Gallium but is there any way to make this work? Ubuntu-12.10-2012-10-22-09-13-53.log (61.7 KB) - added by Perryg 6 years ago. Xorg.0.log (24.5 KB) - added by Perryg 6 years ago. glxinfo.txt (24.4 KB) - added by Perryg 6 years ago. vboxadd-install.log (1.2 KB) - added by Perryg 6 years ago. Xorg.1.log (30.4 KB) - added by michael 6 years ago. mint-log-from-VBox.log (9.1 KB) - added by Perryg 6 years ago. mint-glxinfo.tar.bz2 (3.0 KB) - added by Perryg 6 years ago. VBox.log.zip (18.2 KB) - added by lkj 6 years ago. Hmm, you say that vboxvideo fails to build, could you also attach content of /var/lib/vboxadd-install.log? Another strange thing that has me stumped is if I modprobe vboxvideo it creates the /dev/dri/card0, but if you try to run glxinfo, glxgears or unity test. the guest aborts immediately. 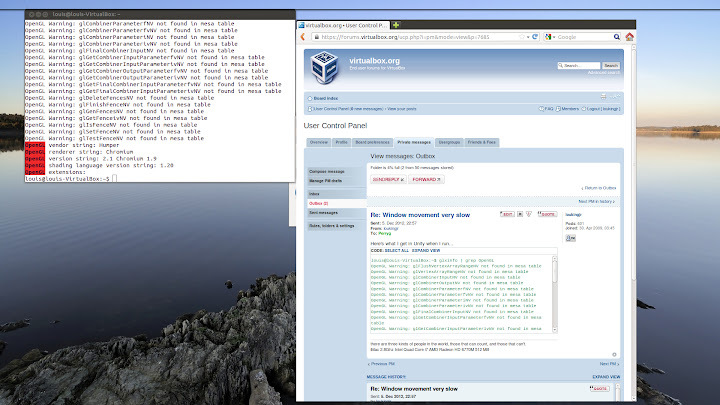 Oh and just a heads up Fedora 18 is using the same VMware opengl Gallium 0.4 on llvmpipe (LLVM 0x301. mesa says it supports both hardware and software rendering. This seems to be where all the problems start. Once in software mode it is impossible to get it to hardware mode using VBox (well at least for me). llvmpipe is just the current generic software fallback if hardware acceleration fails. Gallium3D is just a toolkit which can optionally be used for building graphics stack drivers - llvmpipe is based on Gallium3D, vboxvideo is not, but as they work independently that shouldn't cause any problems. [ 26.022] (EE) VBoxVideo(0): DRIScreenInit failed, disabling DRI. So are you saying this is working for you and not for me? I don't have a problem with Ubuntu 12.04 or Fedora 17 and the biggest change I could find was that they are now using a native software rendering approach so I naturally assumed that would be the reason. I especially found it interesting that the guest would abort if I modprobed vboxvideo and then logged out and in so the driver was active, then run glxinfo. No, I can confirm that it fails here too. I will have a look to see what is happening. I suspect that the reason is that Fedora and most likely Ubuntu too are removing/have removed support for DRI1 drivers <1>. Looks like you're right. So what next? No hardware acceleration makes virtual machines that do not support fallback very difficult to work with. Yes this fixes the mouse issue but that is not what the ticket is about. Using the commands supplied, I get full 3D accelleration. So you have /dev/dri/card0 and can run glxgears and it not abort? Can you share how or what you did to be able to use vboxvideo? Would it be possible to post your /var/log/Xorg.0.log so I can compare it with the one I posted here? Tried it out here, and indeed "/usr/lib/nux/unity_support_test -c -p" says that it is using Chromium and that Compiz is supported. I will attach my Xorg.1.log (the X server crashed previously) for reference. Looking at it suggests that on Ubuntu at least we may simply need to add a udev rule. And you can run glxgears without an abort? I have been able to get it to say 3D enabled but when trying to get it to actually render 3D the guest aborts. I will install another clean 12.10 and see if it may be something I have done while testing in the meantime. No, glxgears killed the guest. But Compiz definitely looked and felt accelerated. Yes as I suspected. The software rendering will allow Compiz to work but if I kick in some real test where it actually has to hit the hardware it aborts the guest immediately. Nothing shows in VirtualBox or syslog of the guest. Its just like you pulled the plug on the guest. Oct 24 12:29:11 ubuntu-12 kernel: [  960.944081] [drm] Supports vblank timestamp caching Rev 1 (10.10.2010). Oct 24 12:29:11 ubuntu-12 kernel: [  960.944081] [drm] No driver support for vblank timestamp query. So it does crash software rendering when vboxvideo is enabled. My Compiz works, but I hadn't tried glxgears - I thought I had, but I probably ran glxinfo. Changeset 43742 does enable vboxvideo now so that part is fixed. However the real issue still exists. Anything that actually tries to touch hardware aborts the guest. Another thing I noticed is sometimes running glxinfo aborts the guest as does the unity test now that vboxvideo is enabled. We didn't include that change in 4.2.4, as there were still too many open problems with 3D in Ubuntu 12.10 guests, and we thought that slower but more reliable software rendering was preferable until we have fixed them. I will watch SVN for changesets that address this issue and report back on results. SVN updates released today to (public) /trunk seem to fix this issue. All testing apps as well as glxgears work now on Ubuntu 12.10. I still need to test this in Fedora 18 but since that is not a release I have not been too concerned. Right, the issue should be fixed now. Here is a test build that could be used for testing. One should update both VBox host installation and Guest Additions. Let me know if you need a test build for some other host platform. and with Hardware 3D (as usual) and post fps you get for both cases here. Also in case you have glxgears working better with 3D hardware acceleration on some other guest platform, could you specify which fps you get and what platform is that. Here is another test this time Ubuntu desktop. The previous test was on a laptop and I suspect the reason for the really low FPS. Just so we see apples to apples. Mint 13 has a better FPS. Based off Ubuntu but I am running the cinnamon DT instead of Unity or Gnome 3 the ones above were. Host Ubuntu 12.04 Desktop. Here you go. It contains both 32-bit and 64-bit versions. A Mac OS X version would make my life complete. Please? I can confirm this is working, Windows 64-bit, Ubuntu 12.10 guest. Mouse cursor seems to be acting sensibly too. You mentioned before that both the application along with the guest additions should be updated. Since I didn't see an update to the Virtual Box guest additions extension here, is there a method to derive a package from the installation medium you provided? Sure, VBox VM menu "Install Guest Additions" should work. The Guast Additions iso image actually gets placed in VBox install dir on VBox host installation. Thanks for the information. My concern is with the VirtualBox extension pack (the .vbox-extpack file) since the installation package does not include this (from what I can tell). Should the 4.2.4 version be used? I know it isn't supported yet but thought you should know. Ubuntu 13.04 has the same problem. But the new fix does not work. It does not crash but you can not get HW acceleration, only software acceleration. I do get Unity 3D support now, but the display is totally messed up. So I needed to turn off 3D in settings for now. I loved the speed of 3D acceleration though! This is what I experienced, even on a fresh Ubuntu install (I thought it might have been an issue with my previous installation given I used Ubuntu's packaged guest additions, but the new box has the same symptoms). This is running Ubuntu 12.10 64-bit guest on OS X 10.8.2 host using the same software versions as fpn. Ubuntu 12.10 64bit guest, runnning gnome-shell. /usr/lib/nux$ ./unity_support_test -p reports hardware rendering is working. gnome-terminal. Enter a few characters. Nothing changes in terminal window. Switch to overview mode (alt-f1). Entered text is visible in small preview window. Switch back to normal mode (alt-f1). Entered text is visible. Open firefox. Select bookmarks menu. Menu usually (about 75% of times) appears as black box, the size of bookmarks menu. Open webpage in firefox. Scroll to end of page. No scrolling is displayed. Switch to overview mode (alt-f1). Small preview window is seen in scrolled state. Switch back to normal mode (alt-f1). Page is scrolled to end. I was able to eliminate most of these by setting Framebuffer object setting in "OpenGL" config plugin in CCSM to "off"
This has made no difference to the problem I describe below. to a new test build, that fixes the 3D acceleration problem on OS X host system and Ubuntu guest system? Is there some way to change the detection and loading of the VBox DRI? What I am seeing is the first boot when the OS detects that hardware acceleration is not available it reverts to (LLVM) and for some reason the VBox module gets loaded but not actually used. Logging off and back in a time or two, or resetting the DT usually fixes this, but is very annoying. Yes, and we're going to fix that in a bit, just after completing some more urgent 3D-related tatsk we have here. Is this issue just a question of vbox dri library being loaded, yet unused? If so, then why do you feel it's so annoying? Because it requires a minimum logoff and back on after a new boot (sometime several) to get direct rendering to work. Up to that point even a terminal is sluggish on any OS that has a modern DT since everything must use software rendering now until you get the HW rendering to work. I am glad you know what needs to be done and will wait patiently for the fix. This wasn't so much of an issue when we had fallback as one could choose the 2D DT and not worry about it, but they removed the fallback and now we must deal with it. Replying to Perryg: What kind of rendering issues do you see, and under which guest OS version(s) exactly? Could you give some screen-shots? Screenshots will not show what I am talking about. I see this on the newer OSes that have chosen to eliminate everything but their 3D desktops (Gnome3) and decided to use the gallium LLVM and software rendering if they can not detect you have a video card that supports direct rendering at boot time. There are no drop outs or screen corruption it is just everything is really sluggish. I can type faster than it is replayed on the screen and I don't type that fast. Scrolling is slow and jerky. Opening and closing application windows is slow. That kind of thing. I can help this by turning off all the animated decorations in Compiz but it does not work around everything. Once I get direct rendering to work (Chromium instead of gallium) everything works as it should. Replying to Perryg: Sorry, I think there is still some misunderstanding here. (according to your later comments) software rendering works slower in that case (i.e. in the case of 3D is disabled on host and vbox dri is loaded in guest). Are you saying that preventing vbox dri from loading in case 3D is disabled makes the software-based rendering better? With 3D disabled on host, software rendering fallback should be used, and vbox dri should not affect it in any way. Yes there is a misunderstanding here and I am more than likely to blame. I should have created another ticket. I will if that would help. Leave 3D enabled in the guest settings. Boot the guest and it will fail the test to detect direct rendering and instead use the guests software rendering, which is very sluggish. Log out and back in a time or two and the guest will finally detect and allow the VBox direct rendering and everything is as it should be. If I run glxinfo | grep direct and it returns no everything is sluggish. Log out and back in and run the same until it returns yes then everything is as it should be. It appears to be a load order where it does not detect the VBox drivers at boot and reverts to the guest software rendering, but if you wait a while long enough before logging in (only works rarely) or you log off and back in the guest detects the VBox video and uses direct rendering. Ok, thanks for the explanation. I personally never seen issues like this. Could you try settings CR_DEBUG_FILE_PREFIX=/path/to/log/file_prefix environment variable globally in guest (so that guest window manager, compiz or gnome, whatever, see it on startup), re-boot/re-login the guest and post here the generated log files please? And this is what I get at log off an back in (much faster since it is using Hardware) although the other errors may need to be addressed it doesn't seem to cause a large problem. [    46.766] (EE) [drm] drmOpen failed. [    46.767] (EE) VBoxVideo(0): DRIScreenInit failed, disabling DRI. As you see no DRM errors after logout and in and speed is back to normal. 3D acceleration causes the left-sided Dash-bar to crash immediately. Also all upper window bars disappear, so it is not possible to close or minimize any window. Navigation is impossible that way. Also many objects appear only if the cursor moves over them. The behavior of the orange selection area is fast now, however. What can I do to prevent Unity/Compiz/Dash-bar from crashing/disappearing? I can't get the setting you provide to generate anything. Do you get the vbox chromium logs generated once it starts using direct rendering though? Also, am I getting you right, that when this issue occurs, all and any GL program (e.g. glxgears) you run until re-login use software rendering? I probably didn't configure it correctly as I don't see anything getting generated. I placed CR_DEBUG_FILE_PREFIX=/path/to/log/file_prefix in /etc/environment (global) and even in ~/.profile. Where would the logs be? I changed to to CR_DEBUG_FILE_PREFIX=/home/mint/file_prefix thinking the path should be absolute. Everything including glxgears is sluggish when it first boots. Only when a log out and in and the dri/drm starts actually working does it actually speed back up to normal. I see the same thing on my Ubuntu host system with Intel Arrandale graphics. Switch to a virtual terminal and run DISPLAY=:0.0 unity --replace. Once it has been running for more than about thirty seconds it is usually stable. Maybe this log will help. I start mint and login, then log off and in. VBox does not show the normal 3D entries in the bottom of the log file until I log off and back in. OK I got the command to work finally, don't know why it did not to begin with, but I have attached the 3 files as mint-glxinfo.tar.bz2 above. Funny thing is nothing is generated at first boot just like the 3D messages at the bottom of the VBox log file until I log off and in. Then I see both. I'm having issues with Unity on the 4.2.5 version for OSX. It is not rendering Unity correctly and in talking to PerryG, it seems the Linux version of VB is not having the same problem. Something in the OSX code perhaps. This command does not help :( No changes! Still, since I see this on a physical system when VirtualBox is not running it is most likely a Unity issue rather than a VirtualBox one, so you are probably best taking it to Launchpad. Any fresh links to enable 3D accel for a win7 64 host with a linux guest (ubuntu 12.10) please? Thank you. In ubuntu I did "sudo /media/lafa/VBOXADDITIONS_4.2.5_82479/VBoxLinuxAdditions.run" to install guest additions. Enabled 3D Acceleration in Vbox Settings rebooted. in Ubuntu executed "ccsm" go to OPENGL and disable everything (sync,texture,framebuffer,vertex, buffer swapping), this makes Compiz work a lot more stable, in VirtualBox. In Full Screen mode, the mouse works great, but in my macbook pro 15 retina display, I'm having problems the VirtualBox rendering of the display of the guest OS, seems some calculation of X and Y axels to render the screen is off, by a lot and the mouse can not hit the right location on the guest OS. Here is the link to a image reproducing the problem in window mode, where the mouse is useless because of the rendering bug. Thanks for replying but the issue is that the beta VirtualBox binaries for win7 are not available no more at the links given earlier in the thread (unlike the OSX ones). I don't know if this is any help, but here is a solution for 12.10. This ticket seems to discuss a number of issues, many of which should now be fixed. I will close it, please open new tickets (or find appropriate open ones) if necessary.